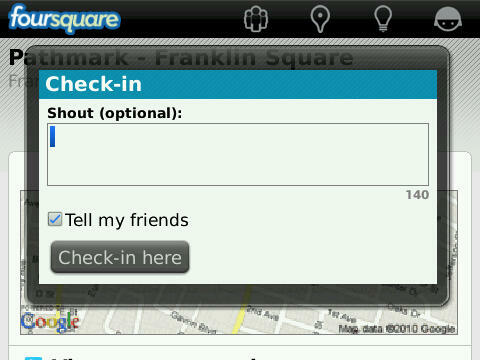 Foursquare allows you to connect to and meet new friends while exploring your city using the GPS on your BlackBerry device. 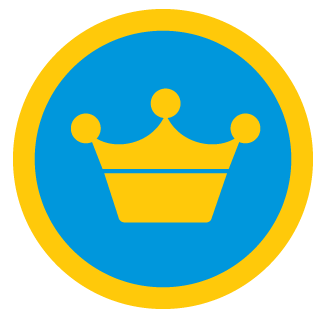 By exploring and finding new places, members are rewarded by earning points, badges and becoming mayor when they "check-in." 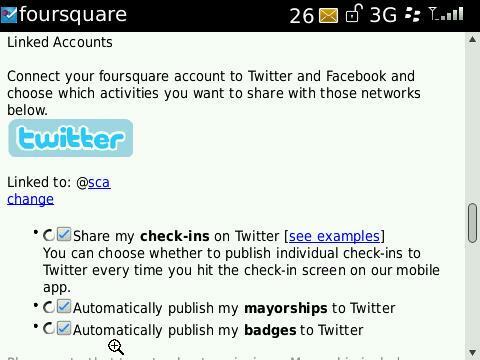 Users can also share tips and their location with friends and followers by linking their account to Twitter and Facebook. 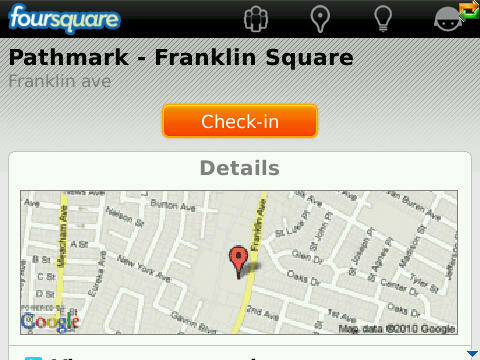 Foursquare can be downloaded through BlackBerry App World or OTA at http://foursquare.com/blackberry/beta. Please note that it is mandatory to do a battery pull after installing even if the application does not prompt you to do so as per the company website. 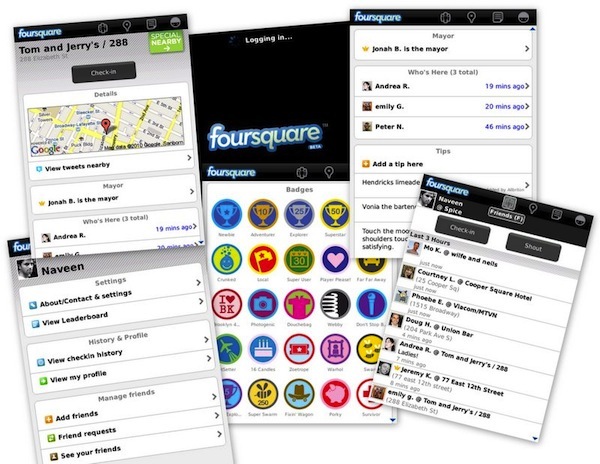 After your phone reboots, you must modify your BlackBerry's User Permissions so that foursquare can properly connect to the internet. 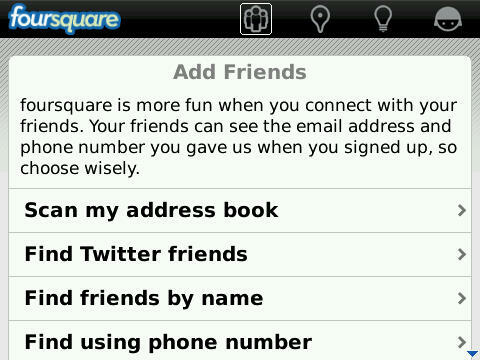 On your BlackBerry, go to "Options" > "Advanced Options" > "Applications"
Change the permissions for "Connections", "Interactions" and "User Data" to "Allow"
Now that you've changed the app permissions, locate the foursquare icon on your home screen or in the Downloads folder to begin. Existing users can enter in their email address /phone number and their password. New users should click on the need an account link in the lower right hand corner. 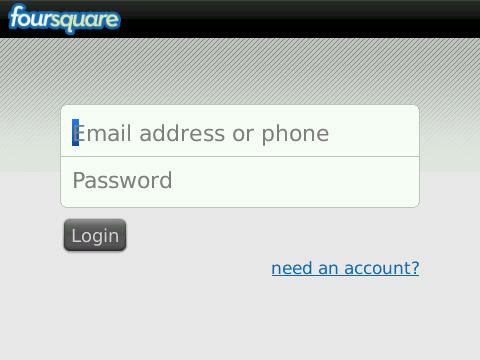 With the foursquare app, you can create an account from your phone without the need to visit their website. 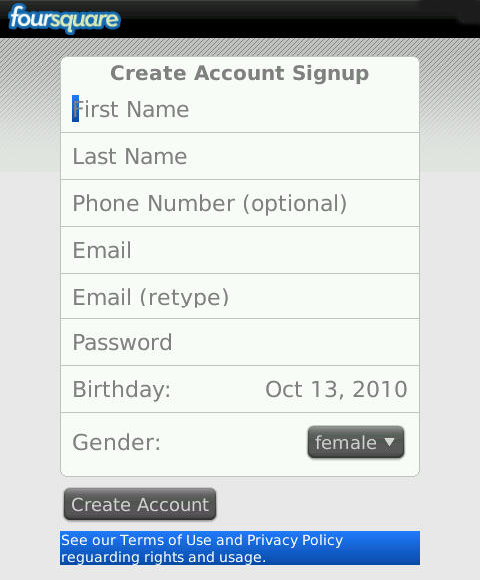 In the create account screen enter in a first name, last name, phone number (optional), email, password, birthday and gender. For gender you can select I'd rather not say. Then all you need to do is click the Create Account button and you're all set. 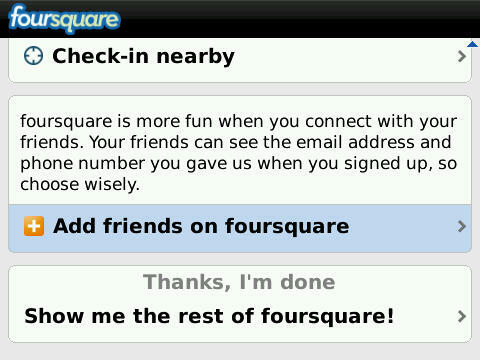 To make the most of Foursquare you will want to upload a photo of yourself. To do this, click on the "Me" icon that resembles a face in the upper right corner. 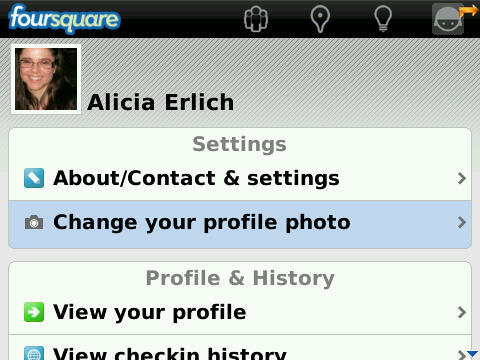 From there you can upload a photo as well as add more details to your profile. 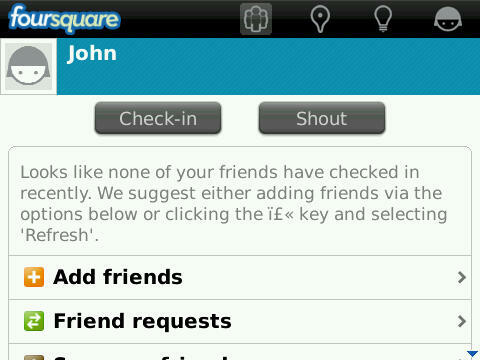 Please note: members can modify their name and privacy settings by accessing their account information on the foursquare website. In addition, if you decide to create an account via your home computer you have the option of joining by using your existing Facebook account. Now that you've created an account you can add your friends and be able to track their whereabouts wherever they go and vice versa. 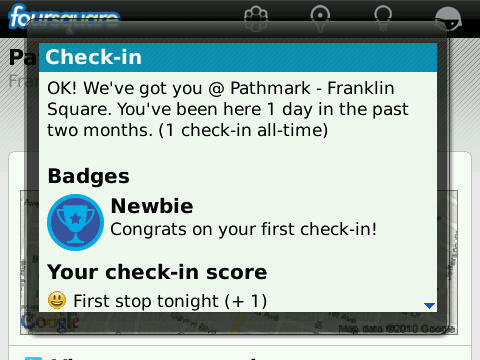 Simply scroll down in the welcome screen and select add friends on foursquare. Friends can be added four ways: scanning your address book, accessing your Twitter account (if applicable), searching by name, and by phone number. When a match(s) is found you will be presented with the list and can choose which ones to add to your account. 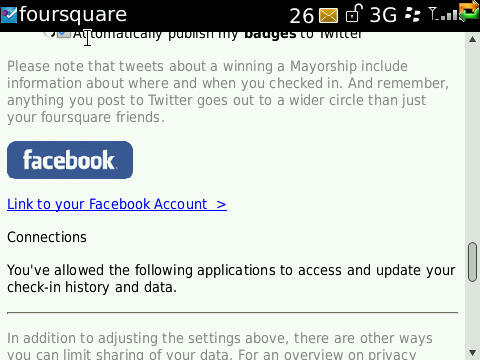 Your friends will receive a notification asking them to approve your request. Now that you're setup all you have to do is click on Check-in. 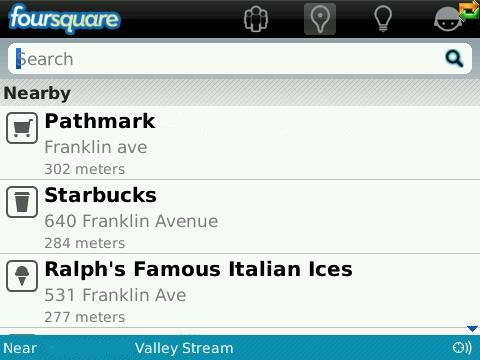 In order to determine your location and create a list of nearby venues, Foursquare accesses the device's GPS. 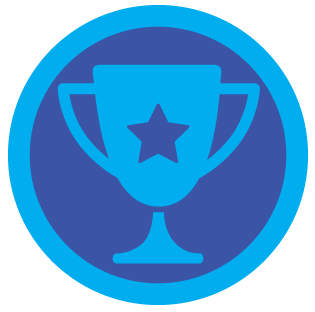 Once you have selected a venue you are on your way to collecting points, badges and even becoming mayor! Finally, Foursquare can be linked to your Facebook and Twitter accounts, allowing you to share the venues you've visited and the badges you've earned. Linking accounts is optional and not mandatory to participate. If you choose to do you, access your profile from their website at http://foursquare.com (device or computer), log in, and click on Settings. Then scroll down and find the section labeled Linked Accounts. Once this is complete you can explore and share all the new places you visit with your friends and followers. Congratulations and have fun!